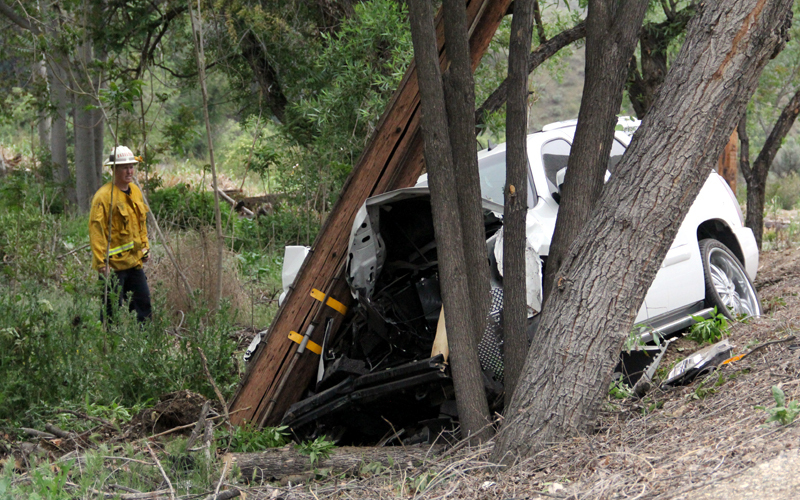 A Lancaster man is in stable condition following a collision Monday afternoon on Bouquet Canyon Road in Saugus. Witnesses said the driver, Jason O’Keefe, 24, was traveling eastbound on Bouquet at Shadow Valley Lane, north of David Way, when he swerved to avoid another driver making a left-hand turn over a double-yellow line. O’Keefe lost control of his Yukon Denali SUV and struck a power pole. Live wires sagged over traffic lanes and nearby residents experienced a loss of power. Los Angeles County firefighters from Stations 108 and 111 responded to the collision, as did sheriff deputies and CHP officers. O’Keefe sustained moderate injuries in the crash. Officer Figueroa of the Newhall CHP said speed was a contributing factor. Southern California Edison crews were on scene as of 2:30 p.m. to restore power.